The Navas Instruments MMS-4000 moisture and ash analyzer (Thermogravimetric) will provide fast, consistent and reliable analysis without the need for constant interaction. The instrument can even work at night without operator attention! The MMS-4000 is ideal for applications where analysis of a large amount of samples is needed, like flour, food, feed, whey, dairy products, coal, coke, cement, iron ore, other ores and other applications. 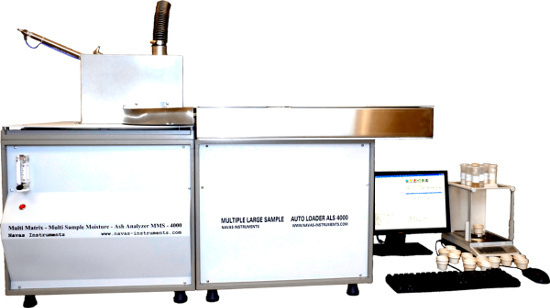 The auto loader has capacity for 77 samples, and can process 92 samples automatically overnight! With multiple temperatures and steps with configurable parameters, the MMS-4000 offers the operator more flexibility. Organizational software allows for different materials; solids, liquids and powders to be loaded simultaneously. The software organizes the individuals into batches and analyzes them accordingly. Standard desktop PC or laptop with Windows and with Pentium or higher compatible processor for system control.